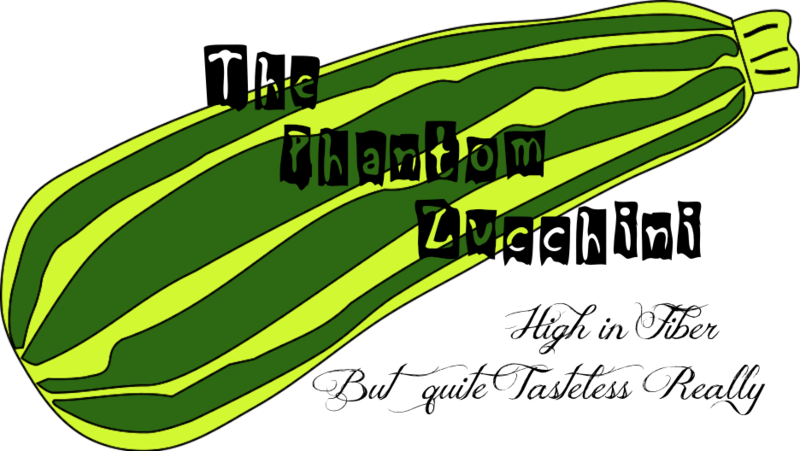 The Phantom Zucchini: Just Because You're French, Doesn't Mean You're Not a Whore. Just Because You're French, Doesn't Mean You're Not a Whore. It's another cold morning sitting in front of my roaring fire, waiting for my muse. "Roaring fire,you might ask? "But I thought you said wood didn't burn!" you might exclaim. "Did you discover the secret?" "Were sacrifices demanded?" "Was Stevie Nicks music played? " you might question enough to completely annoy me. Well, Here are the answers, you inquisitive little bastards. 1. Yes, roaring fire. As in lion-roaring. As in pissed-off grizzly bear roaring. I'm not kidding. It's downright gorilla showing all her teeth-roaring scary. 2. Yes, I did discover the secret of this morning's fire, however this does not insure that it will work tomorrow or that I will ever be able to start a fire again. Fire is just too magical to understand and that is why our ancestors worshiped it and if we know what's good for us we'll start doing the same because the only time fire burns is when it is angry. (AMENDED RULE NUMBER ONE) And yes, I did say once, (as if that counts for absolute truth, ) that wood doesn't burn, and, with the one exception stated above, I still stand by that proclamation of great importance, however, again, we are talking magic here. The ordinary rules do not apply, hence I cannot be held responsible for statements made under the influence of magical mystical activities involving ancient rituals involving scary gods including the one who impersonates a hitchhiking Jimi Hendrix. 3. Sacrifices were demanded, yes. And I calmly explained to the gods that as scary as gods of the ancients may think they are they are no match for me when I get Really Crabby, so they better watch out and re-phrase that "demand" so it sounds more like a respectful petition if they know what's good for them. 4. And yes, of course Stevie Nicks music was played. This is not my first rodeo. You know, I have to say this once and I won't say it again for a while. When I am trying to concentrate and channel my Muse who is probably sleeping it off somewhere with someone she barely knows, I really don't appreciate being distracted by the self righteous attitude coming from the empty wine bottle on the coffee table. 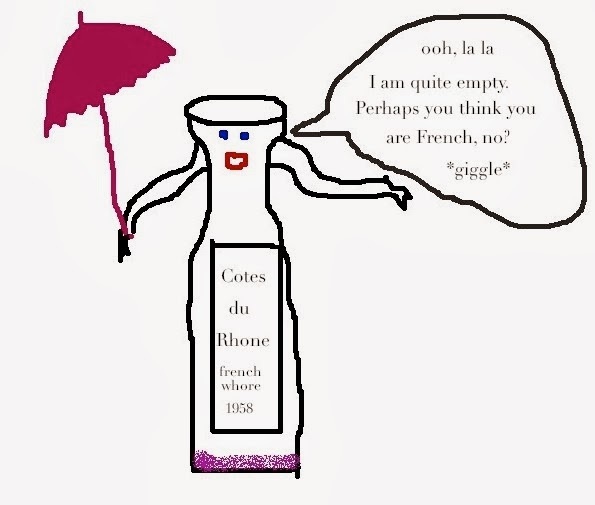 I mean, I know she's french and all, but if she is even suggesting, in that superior way of hers, that I drank more than my fair share of that bottle last night, well apparently she is drunk on her own......well on herself, because I had help, let me tell you that. Lot's and lots of help. Why there must have been at least 24 people here last night. We are very social, you know. We are royal, after all. And the fact that there is only one unwashed wine glass on the bookcase is not an indication that there was only one person drinking wine. It's just Sir Dave that person, who used the aforementioned wine glass did not even have the courtesy to bring it out to the kitchen to be washed. Good thing we have slaves certified, bonded, very well paid staff. So you might want to rethink that detective career, Mademoiselle Cotes du Rhone, is all I'm sayin,' vous pas cher prostituée française. You may be wondering why I am sitting in my living room, wearing the ugliest sweater ever created by individuals of at least normal intelligence and skill, while threatening and/or insulting firewood and empty wine bottles. Yeah, me too. I've gotta find something to do.